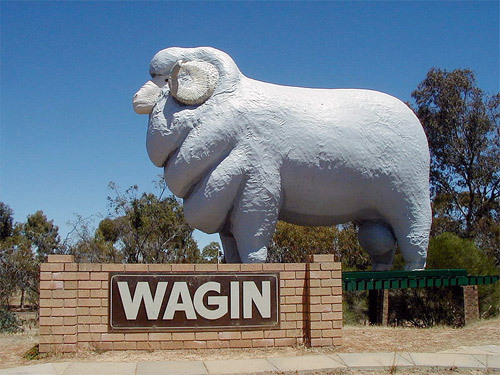 Wagin's giant ram. Photo from "Nachoman-au", Wikipedia. If you live in southern Western Australia, or feel like a holiday, you should get to Wagin next weekend, March 8 and 9, for Woolorama. Woolorama is Wagin's annual agricultural show which has, as the name implies, a strong focus on woolly things - like sheep. It's on for two days, Friday and Saturday, and is a great day out for the family. Best of all, Woolorama has an art exhibition, competition and sale and it always attracts art of a high standard of entries from around the state. If you don't care much for sheep, go for the art. I'll be there on Saturday afternoon. I'll most likely be sitting watching (and listening to) someone playing guitar somewhere. There's always someone playing a guitar. Maybe I'll see you there. I'll be the guy in the hat.